Lagoons represent one of the oldest forms of biological wastewater treatment, having been used in some form for more than 3,000 years.4' They have been used as the only means of treatment prior to discharge to surface waters and for pretreatment and/or storage prior to treatment in a conventional system or a wetland. A wide range of industrial and municipal wastewaters has been treated in lagoon systems. Lagoons are mechanically simple, which often translates into low capital and operating costs. However, this mechanical simplicity masks a degree of physical, chemical, and biological complexity unparalleled by other biochemical operations, resulting in a poor understanding of the factors that affect process performance. As a consequence, the effluent quality from lagoons has often been relatively poor, relegating them to uses where high-quality effluent is not necessary. Algal growth is a particular problem. Algae generally settle slowly and, consequently, pass into the effluent where they increase the concentration of suspended solids and biodegradable organic matter. Recently, the rational application of fundamental principles, including understanding of the factors influencing algal growth, has led to the development of aerated lagoon systems with significantly improved effluent quality. :s Back ground will be provided in this chapter on the variety of lagoons used in practice, but emphasis will be placed on design of the newer generation of aerobic lagoons. Figure 14.1 Schematic diagram of a lagoon (vertical dimension exaggerated). lagoon is often configured so that the soil needed to construct the sidewalls is excavated from the interior, i.e., cut and fill are balanced. Natural sealing will occur to some extent as wastewater solids enter the pores of the soil and reduce the seepage rate. However, it is now common practice to provide a liner for positive seepage control. Materials used include: natural clays (such as bentonite), asphalt, synthetic membranes, and concrete. Regardless of the liner material used, a concrete apron is often provided at the water line to simplify maintenance. The remainder of the sidewalls above the water level are often covered by grass. Details on lagoon construction are provided elsewhere. "141 Influent and effluent structures complete the lagoon. Influent enters at one end, and the treated wastewater is collected in an effluent structure, generally located at the opposite end. No formal mechanisms are provided to retain biomass within the lagoon. Consequently, the solids retention time (SRT) approaches the hydraulic retention time (HRT), and therefore HRTs on the order of several days are typically used. The term lagoon refers to a configuration, not to a set of controlled environmental conditions within a bioreactor. In fact, the environmental conditions depend on the process loading and operating conditions, causing significant variations in the physical, chemical, and biochemical conversions occurring, and in the treatment efficiency obtained. In short, lagoons can be used in a variety of ways, and a wide range of lagoon options exists. Many approaches can be used to characterize lagoons. ""'""4144 We use a simplified method based on the type of metabolism occurring and the mechanism by which the terminal electron acceptor is supplied. In anaerobic lagoons, biodegradable organic matter is stabilized by its conversion to methane and carbon dioxide. In other lagoons, oxygen is provided as an electron acceptor, and biodegradable organic matter is stabilized by its conversion to carbon dioxide and water. Two principal mechanisms are used to provide oxygen: (1) the growth of algae, which produce oxygen through photosynthesis; and (2) mechanical means, such as with surface aerators, diffused aeration by blowers, and unique systems specifically designed for lagoons. These differences provide the basis for the three types of lagoons discussed in this chapter: (1) anaerobic, (2) facultative and facultative/aerated, and (3) aerobic. Anaerobic Lagoon. An anaerobic lagoon (ANL) is a low-rate anaerobic process (see Section 13.1.3) in which biodegradable organic matter is stabilized through its conversion to carbon dioxide and methane. Compared to other lagoons, ANLs are constructed as relatively deep structures, typically ranging from 2 m to 6 m deep. This minimizes the lagoon surface area for a given volume, thereby minimizing oxygen transfer, odor release, and heat loss from the surface, which is important because ANLs are commonly not covered. '1" " However, they can be covered to collect the methane gas produced and to eliminate odor release, as illustrated in Figure 13.5. Another alternative is to provide oxygen to the top layer of the lagoon so that the odoriferous compounds are oxidized to less odoriferous materials before they leave the lagoon. This aerated "cap" can be provided by directly aerating the top layer of the lagoon or by recirculating oxygenated process How to it. 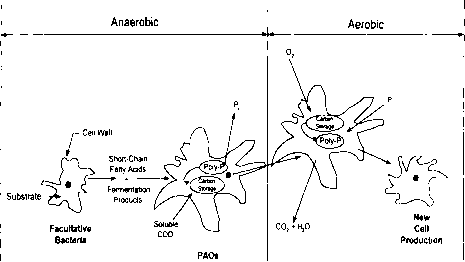 Although some oxygen transfer can occur across the surface of uncovered ANLs, anaerobic conditions develop because the addition rate of biodegradable organic matter greatly exceeds the oxygen transfer rate. The loading rates also preclude the growth of algae, which would produce oxygen if they were present. Influent digestion chambers are sometimes incorporated into ANLs, particularly those treating more dilute wastewaters such as municipal wastewater. 1 Mechanical mixing is not provided, but gas evolution from the digesting organic matter provides some mixing. Nevertheless, settleable solids and floating materials accumulate in the lagoon, providing surfaces for microbial growth. The resulting retention of biomass makes the SRT greater than the HRT, but the difference is difficult to quantify. HRTs can be as high as 20 to 50 clays, but many ANLs are designed and operated with HRTs less than 10 days. '1 ""'"" As discussed in Chapter 13, an SRT in excess of 20 days (more likely approaching 40 or 50 days) is required to produce a stable, effective anaerobic treatment process, even when bioreactor temperature and other environmental conditions are carefully controlled. No such controls are provided in an anaerobic lagoon. Consequently, the fact that ANLs work suggests that significant retention of biomass occurs to achieve the required SRT.